a wireless operator q.v. in employment of Marconi Wireless Telegraph Company. is in charge of, and responsible for, the efficient working of wireless telegraphic instruments on board ship, or at any transmitting or receiving station; receives and decodes incoming, and transmits outgoing, messages; carries out minor repairs and adjustments to installation; holds certificate of proficiency. operates wireless apparatus to transmit and receive messages. 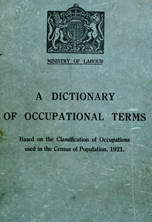 assists wireless operator q.v., when latter is off ' duty, by "listening in" for distress or other signals; is not required, and usually is not competent, to transmit and receive messages or carry out any adjustments of repairs to installation; frequently is an apprentice learning wireless telegraphy.